The Chimes is a curatorial intervention into the city of Toronto that will function to disrupt the disinterested inhabitants of the city and provoke a physical and emotional engagement with De Pape’s The Chime. 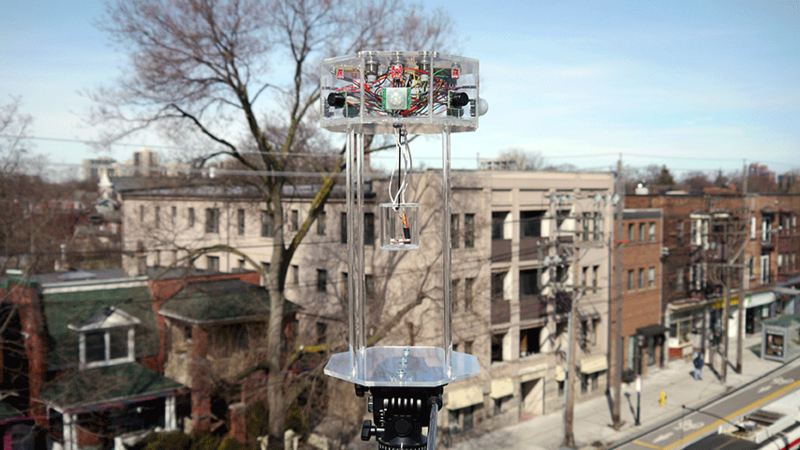 De Pape will construct five identical versions of The Chime to be installed at five locations in Toronto. The Chimes will record environmental data such as temperature, sound, light and movements in the surrounding area and translate them into data sonification or sound data which will emanate from the machine. As the public subject approaches The Chime they will discover the machines melodic chime sounds which will further draw them into the work in order to understand the beautiful disruption created by The Chime. The subject will be provoked to interact with and manipulate the machine using their own physical body through moving around, blowing on and speaking to the machine, thereby becoming a composer using the machine and the physical body as instruments. The work is intended to disrupt the urban inhabitant’s disconnect from their surroundings and create a meaningful reciprocal relationship between human and machine that will affect the human’s emotional state and enhance their experience of the city. The Chimes will also call attention to both the shared and disparate experiences of individuals in the public sphere. The work and subsequent documentation of the reciprocal interactions between human and machine will provide a point of departure for discussions around public experience and the ways in which individuals can employ and inhabit a single space in different ways. The Chimes will record the performance of publicness, as Rosalyn Deutsche views this performativity as inherent in the creation of public, through environmental data collection dependent the machine, the space and the public ‘performers’.